Singh says that the police were mute spectators to the carnage. In fact, they helped the mob as the looting took place. Tears well up in his eyes as Bikramjeet Singh recalls the horrors of the carnage of 1984 that is still fresh in his mind three decades later. After managing to escape to Chandigarh with his wife and one-year-old son, Singh started his life here from scratch. Going around on a scooters selling electronic goods, Singh set up a business of exporting handicrafts. The journey was not a smooth one. Singh used to reside in Bokaro with his family and run an electronic goods shop when the riots broke out. Recalling the horrific scenes, Singh said that as they woke up on the fateful day on November 1, houses and shops on fire greeted them in plenty. His shop was ransacked and all the items stolen. Singh says that the police were mute spectators to the carnage. In fact, they helped the mob as the looting took place. “My father asked us to shift to a house that we had given on rent. The tenants, who were Hindus, saved our lives. My wife, son and I, along with my sister, hid under a bed in order to save ourselves. In the meantime, the mob ransacked our house and looted everything. As they came looking for us, the tenants refused to cooperate,” says Singh. His wife Gurminder Kaur recalls that they had to stuff cloth in the mouth of their one-year-old son to prevent him from making any noise. It was when a police truck came to the area that Singh’s famil, along with that of several others, got out of their hiding places and were taken to the office of the Superintendent of Police where they spent the night. The affected families were then shifted to a missionary school. In each room, several families were accommodated. Those who had warm clothes shared with the others. While Bikramjeet got an FIR registered, there was no progress in the case. With not much having been left for the family in Bokaro, they decided to shift to Chandigarh where Singh set up a shoe shop. However, the business did not succeed. Singh says that the conditions were such that the markets were down and people were not in a state to spend too much. Thereafter, Singh decided to shift back to his old business of selling electronic items. The going was not smooth as he went around on a two-wheeler with television sets and other items to sell these. After years of struggle, Singh started getting orders for exporting wooden boxes and handicrafts. He set up an office in Zirakpur and constructed a house in Sector 32, Chandigarh. Singh says that even 30 years after the carnage, none of those guilty has been booked. “The victims are still waiting for justice to be done. It is only then that our wounds would heal. For the politicians, it is just a poll issue that they rake up when it is convenient for them. I hope that the new government at the Centre would take some action against the guilty,” he says. “I have been displaced twice. The first time it was due to partition of the country and later due to the riots,” says B S Chadha, who shifted from Kanpur to the city. Chadha had a flourishing transport business in Kanpur. Apart from that, he owned 11 trucks along with his brother and had a two canal house there. Just two trucks could be saved, while the rest were damaged. Having rebuilt his life in Chandigarh, Chadha says that by God’s grace he has everything now. However, the trauma the family went through and what they saw was unforgettable. The family comprised two daughters and two sons apart from his wife and mother. He opines that it was due to their neighbours and well-wishers that the family was safe. “One of the drivers working for me was a Muslim. He arranged ration for us. The other neighbours used to ensure that the mob did not harm us. I shifted with my family to a gurdwara for a day. However, our neighbours asked us to return and said that they are the ones who would take the blow before anyone could touch us,” he says. Through cracks in the walls of the room where he hid, Chadha saw a person being killed after being squashed by a car bonnet. Chadha was helped by his relatives in Chandigarh who sent some people to rescue them. The hair of his two sons was tied in plaits and they were dressed as girls to ensure their safety. One by one, the children were taken out of the house to the railway station from where they reached Chandigarh. “After settling my family in Chandigarh, I went back to Kanpur to sell my house. There were no buyers as no one wanted to deal with Sikhs. Such was the hatred. It was for a pittance that I had to dispose it. There was nothing left for us there. My sons could not study further. One of them did a course in handling of air-conditioners and the other in refrigeration,” he says. Prior to the riots, Chadha had applied for a house under Chandigarh Housing Board’s scheme and was lucky to be allotted one. After living in a rented accommodation when they shifted to the city, the family shifted to their house in Sector 40. At present, they have rented a shop from where his two sons operate. It was only for 28 days that Kulwant Kaur and her family could enjoy the comforts of their new house that they had purchased in Delhi. On the 29th day, a mob attacked their house and burnt it down. The only relief was that the family got saved. Kulwant and her husband Gurbachan Singh now live in an MIG flat of Chandigarh Housing Board in Sector 40. Recalling the events of that fateful day, Kulwant says that an elderly neighbour warned her on the night of October 31 about the impending attack and asked her to ensure that her husband escapes before that. Kulwant says that they shorned off Gurbachan’s hair to hide his identity. He scaled a wall to enter a vacant plot next to their house and managed to escape the marauding mob. Later, he was given shelter by a friend. Kulwant’s son was 10 months old at that time. She managed to leave her daughter with one of her neighbours who were Muslims, and along with her son and another women, hid in the fields. They were given shelter by a factory owner. However, the attackers also pelted stones at the factory’s walls. The owner then shifted them to another factory. Here, the two women and the infant hid in a small room of the factory. Kulwant says, “I stuffed a dupatta in my son’s mouth to ensure he did not make a sound. He was hungry as there was no milk to feed him. Gurbachan also found his way to the camp. Kulwant says she could not recognise him at first, nor could the children, due to his appearance. When the situation cooled down a little, the family returned to their house only to find it gutted. After staying in Delhi for a year where Gurbachan worked in a private company, the family shifted to Chandigarh. “We were left with nothing after the riots. Life had to start from scratch. Thirty years after the riots, the horror is still alive. My children got education and are now settled in life. However, the wounds are yet to heal. 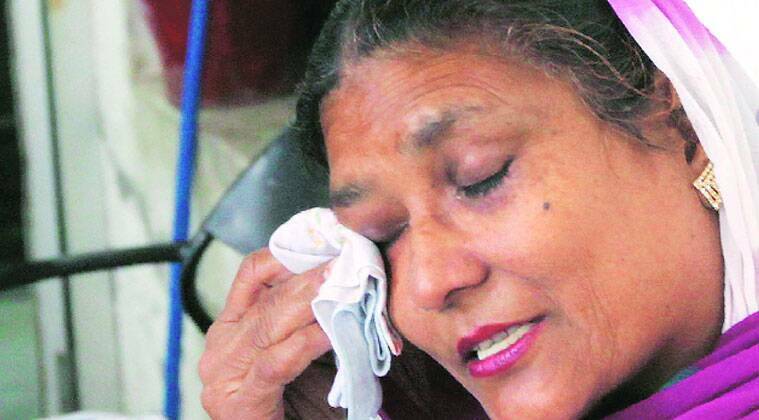 No matter which government is in power, nothing has been done for the victims of the riots,” she says.